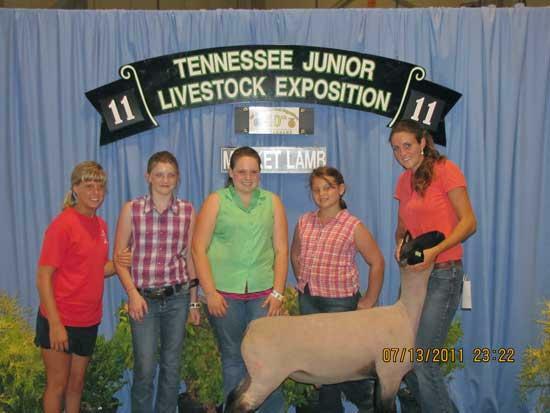 Pictured (L to R) are Kaysi Paul, Kendall Leedom, Hannah Nave, Emily Nave and Katlyn Currie at the 40th annual Tennessee Junior Livestock Exposition Sheep Events held recently at the Hyder Burks Pavilion at Tennessee Tech University. Hannah placed 5th, 7th, 8th, and 10th in her respective classes with her market lambs; Emily placed 7th and 8th in her respective classes with her market lambs, with the market lamb show having in excess of 320 entries. Katlyn received 1st place honors in the skillathon competition, received premier exhibitor honors in the breeding ewe show, and exhibited the reserve grand champion Shropshire ewe. At the conclusion of the market lamb show, Hannah, Emily, and Katlyn assembled their entries to compete in the County Group of Five Market Lamb competition receiving 3rd place honors with their entries. Congratulations to all exhibitors on a job well done.